With the superhigh-resolution third-generation iPad selling like hotcakes, and a refresh of the MacBook Air expected soon, Windows-based laptops are seemingly becoming a dying breed in this "post-PC," Apple-dominated era. Intel, however, is not fazed, and believes that the new class of superthin Ultrabooks can offer everything that the iPad and MacBook Air do--and more. I sat down with Intel product manager Anand Kajshmanan and Intel media relations representative Alison Wesley to discuss what Ultrabooks really offer, and what we can look forward to in Ultrabooks that we probably won't see from tablets and similar laptops. PCWorld: It’s a pretty exciting time for people to buy laptops and mobile devices, with so many great models to choose from now. Obviously Intel is very invested in Ultrabooks. Can you tell us a little about Ultrabooks and what makes them different? Intel: "Ultra" means pinnacle, and we wanted the Ultrabook to be the pinnacle of everything that users have come to expect from their computing device. So we did extensive research into what users' expectations were for their mobile computing devices, and there were four things that really stood out. Users want ultra-responsiveness in their devices (you turn it on and it just works, with no interruptions); the ability to take their devices everywhere, with great battery life and connectivity; devices that just look cool and feel great; and products they don't have to worry about when it comes to security. When we came up with this category, we wanted to deliver all of these things in one device--and not only one device, but a plethora of choices, so each person can pick [the right Ultrabook]. PCW: Many Ultrabooks look a lot like Apple’s MacBook Air. How are Ultrabooks different from the Air, and why would a person choose an Ultrabook over the more popular Air? Intel: The MacBook Air is a great product, sure. It has the Intel Core processor, it's a great choice for someone who wants to invest in the Mac operating system, and it offers some of the things we talked about. But really, with the Ultrabook, it's about offering all those things in the same device--the great responsiveness, the great battery life--and with an operating system that people have come to love over the years, as well as all the legacy applications that they would like to run. And they want to do all this at mainstream price points, which is where we think one of the biggest key differentiators is, and the biggest value that Intel can bring to this space. We can actually get the ecosystem to move to an extent [that it will] bring all of these great features in a laptop down to mainstream price points. PCW: What do you mean by "mainstream price points"? Intel: We say "mainstream price points" rather than exact figures because it differs for every market and depends on your perspective. For example, [we were speaking with] a Korean businessperson at a trade show who said that $1000 was a very low price point for them. But $1000 might be high from your perspective, so we say "mainstream price point" to mean what the market will bear. We have the $300-million Intel capital fund to kick-start this innovation, and we're bringing everyone together and saying, hey, this is a great opportunity. We're definitely working with our partners to supply a lot more volume, which will bring Ultrabooks down to the mainstream price points. PCW: That’s great, because price is, I think, still the biggest barrier for people when it comes to buying an Ultrabook. Intel: Right. We definitely want all of these things--the ultra-responsiveness, the security, and the great battery life--in ultralight systems, with the operating system users have come to love, to be available to the mainstream consumer. PCW: Well, consumers definitely have a lot of Ultrabooks to choose from already. Intel: It's all about choice. That was one thing that kept coming back in all the research. Consumers want more choice. It's such a huge market, and everyone's different. What works for one person doesn't work for another person. But even though there's a variety of choices, a good thing about the Ultrabook specification is that, whether you like an Acer model or a Dell one better, there's still a set of experiences you can count on. PCW: You’re pushing for touchscreen options in Ultrabooks too. That’s an option that Apple doesn’t seem interested in exploring for its laptops. Tell me more about touch Ultrabooks. Won’t the touchscreens drive up the prices on Ultrabooks and keep them from being affordable? Intel: We fundamentally believe in the concept of touch, and touch on a clamshell. We believe it's going to take off in 2012 or at least 2013, especially with Windows 8. It really feels like now is the right time, now that the hardware and software are working really well together. We're strongly encouraging our partners to incorporate touch on the Ultrabooks. We expect several touchscreen laptops in convertible form factors, like the Lenovo Yoga, to show up later this year, as well as screens that swivel around and slide over the keyboard. In terms of cost, yes, the touchscreens definitely will add to it. There's no doubt about that, but it's hard to say now how much it will add. It's up to the consumer whether it will be worth [the investment]. For example, if there's a touchscreen Ultrabook for $800 versus one without for $700, at least the option will be there. Again, it's all about choice. PCW: Speaking of touch, though, with Apple’s recent launch of the superhigh-resolution iPad and repeated mention of this being a "post-PC" era, can Ultrabooks even compete? What do you say about the notion that the $500 iPad is killing off the PC? Intel: The Ultrabook offers an extremely unique value proposition. Every time we've done market research, consumers have told us, "We love touch, but don't touch our keyboards." Even for email, people prefer keyboards. There's no tactile feedback on touchscreens. 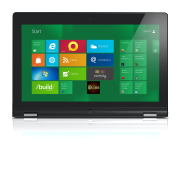 The fact that you have content creation on Ultrabooks is a huge differentiator. Plus, with all the unique form factors, as we said, to be able to use the Ultrabook as a tablet when you want to is an extremely unique value proposition. Consumers have told us that tablets are great for certain things like content consumption and casual gaming, but when there's real work to be done, they really like to do it on a laptop. PCW: So what can we expect next on Ultrabooks? Intel: Besides touch, going forward in 2012 and 2013 we're going to be demonstrating other modes of interaction. As we get better and better processing power, and as our next generations of CPUs show up, we'll be able to integrate other capabilities and hardware technologies such as sensors or accelerometers into the Ultrabook. So, for example, if you want to find a café automatically or do some gaming, you'll be able to take advantage of those built-in technologies. We're really excited about these things, and we don't see a reason why you can't have them on an Ultrabook. We don't think of the Ultrabook as stagnant, but as a work in progress--and you'll see even more capabilities and technologies in the Ultrabook.